Q1. 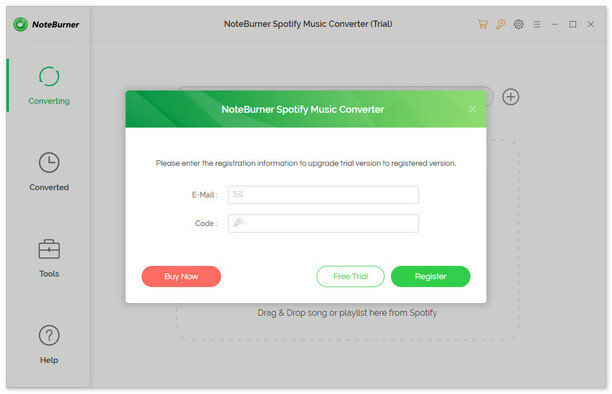 How to register NoteBurner Spotify Music Converter? Run NoteBurner and click button "Menu" on the upper right and choose "Register" in the drop down list. You can also directly click the "Key" icon, and then you will get a pop-up window for registration entry. Simply copy and paste your Registration Email and Code into the registration pop-up dialog. Q2. What can I do if I get the message "Invalid Code" when trying to register? 1. Please make sure you are running the right program. 2. The registration entry is case-sensitive. Please make sure you do not insert any blank before or after the registration name and license code. 3. Should the problem persist, please contact us by e-mail at support@noteburner.com for help. Q3. Why am I limited to convert the first 3 minutes of each audio? It's the limitation of trial version. To unlock the restriction, please purchase a license. If you'd already bought a license, please register the program to get access to the full version. Q4. What's the function of "Intelligent Mode"? Intelligent Mode is a combination of Spotify Record Mode and YouTube Download Mode. When you choose "Intelligent Mode" in the setting window, the conversion rate would be increased a lot thus you can get the Spotify tracks as needed. Q5. How many songs can I import to NoteBurner Spotify Music Converter at one time? Currently NoteBurner Spotify Music Converter supports being added to 100 songs at most at one time. If you want to convert a playlist with more than 100 songs, please open the playlist on Spotify, select all files in the playlist and then drag & drop them to NoteBurner program for converting. Or we advise you to create some new playlists and separately add them for batch conversion. Q6. Can I sort out the output audios by Artist > Album > Title? Yes, you can. Before converting, please go to the output settings of NoteBurner (on the upper right) and click "Output Organized", then choose the "Artist / Album" in the drop-down list. Q7. The output audio quality is unsatisfying. How can I improve it? If you are not satisfied with the output quality, please slow down the conversion speed to 1X for a try. Should the issue persist, please contact us by e-mail at support@noteburner.com for help. Q8. What can I do if the volume of some converted songs are lower than the volume of original ones? If you want to download the songs in full volume, we suggest you can change the setting in Spotify. The most important thing is to uncheck the "Set the same volume level for all songs“ box in spotify. You can find the box through: "..." > Edit > Preferences... > SHOW ADVANCED SETTINGS. Q9. How to submit feedback through NoteBurner program? If you'd like to submit feedback to us, please click the menu button on the upper right and choose "Feedback" in the drop-down list. There you will see the feedback entry. Note: If multiple devices are logged in with the same Spotify account, please make sure you are selecting "This Computer" to play the audio on Spotify when downloading Spotify music with NoteBurner program. Cause: Spotify may not be installed correctly. Solution: Please refer to our Solutions to Error 1001. Solution: Please refer to our Solutions to Error 1002. Tip: If you manually launched Spotify App, please re-launch NoteBurner Spotify Music Converter for a try. Solution: Please re-convert the music or adjust the settings on Spotify by referring to Solutions to Error 1004. Note: If the issue can't be fixed by the recommended solutions above, please send us the following information by e-mail at support@noteburner.com. What's your Windows OS? 32 bits or 64 bits? Are you a Spotify Free user or Spotify Premium subscriber? And what's your Spotify version? Please send us the two log files of NoteBurner. You can find them by going to NoteBurner Spotify Music Converter, Menu > Open Log File. They are called log.txt and record.log. Q11. How to make NoteBurner Spotify Music Converter work with Spotify V1.0.87.491 at 5X speed? Currently, NoteBurner Spotify Music Converter only supports converting music from Spotify V1.0.87.491 or above at 1X speed with SIP enabled. So in order to convert music files at upto 5X speed, please refer to "How to Make NoteBurner Spotify Music Converter Work at 5X Speed?" to turn SIP off. Q12. What to do if your Mac sound is not working after using NoteBurner? The sound has stopped working on your Mac after using NoteBurner? No worries, you can refer to this guide to get your Mac's speakers working again: How to Make Your Mac Sound Work Again?". Q13. How to solve the problem of "Conversion Failed" on Mac? 1. Please refer to this guide to delete the driver file under "/Library/Audio/Plug-Ins/HAL/MJRecorderDevice.driver", then reboot your Mac and retry. 2. Please check whether there is any external audio device connected with your computer including USB, Wi-Fi, Bluetooth and HDMI, etc. If so, please disconnect them and retry. 3. If the above methods cannot solve your problem, please try to revert to the old version of Spotify V1.0.86.